Our Beautifully Designed Rock and Old Fashioned Glasses add a touch of elegance to any occasion. These Rock and Old Fashioned Glasses may be custom imprinted with any design or message you choose. Our Rock and Old Fashioned Glasses are available in many styles and sizes. Call 1-800-233-0828 to order. 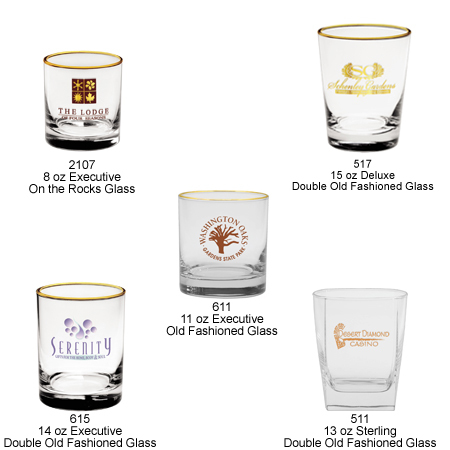 Pricing for Custom Rocks Glasses – Call 1-800-233-0828 for more info or to order! 2107 8 oz Executive On The Rocks Glass 1.91 1.59 1.52 1.47 1.43 1.33 1-5/8" 2-3/4" 9-3/8"
2107 2 Day Quick Print: 8 oz Executive On The Rocks Glass N/A 2.14 2.07 2.01 1.97 1.89 1-5/8" 2-3/4" 9-3/8"
517 15 oz Deluxe Double Old Fashioned Rock Glass 2.18 1.85 1.78 1.72 1.67 1.55 2-1/16" 3" 10-3/4"
611 11 oz Executive Old Fashioned Rock Glass 1.91 1.59 1.52 1.47 1.43 1.33 1-7/8" 3-3/8" 10-1/16"
615 14 oz Executive Double Old Fashioned Rock Glass 1.91 1.59 1.52 1.47 1.43 1.33 2-1/2" 3-1/2" 10-1/16"
615 2 Day Quick Print: 14 oz Executive Double Old Fashioned Rock Glass N/A 2.14 2.07 2.01 1.97 1.89 2-1/2" 3-1/2" 10-1/16"
It's easy to have your own Rock and Old Fashioned Glasses. Simply call 1-800-233-0828, and submit your camera-ready artwork to graphics@kardwell.com (you may also mail your art). The minimum order is just 72 Custom Glasses. You will receive your glasses in about 3 to 4 weeks. Rush delivery is available.